I’ve never met a potato I didn’t like. Therefore, it’s only logical they’d be one of my most-favorite things to grow in the garden. I get all-sorts of giddy when I’m pulling pounds and pounds of them out of the soil and piling them into the wagon to be taken into the house. You haven’t lived until you’ve eaten tender new potatoes, fried in a bit bacon fat and smothered in sour cream and chives. Grocery store potatoes don’t even remotely compare. Not even close. I’ll stop waxing poetic about potatoes if you promise to try growing them at least once. Sound like a deal? Let’s talk details so you know exactly how to make this potato-gig happen. Seed potatoes– you need em. And you’ll want “official” seed potatoes– not sprouted, shriveled grocery store potatoes. Using proper seed potatoes ensures you won’t be introducing any diseases into your garden, and you can find some pretty cool varieties that’ll grow better in your climate. There are a variety of online seed potato suppliers (Google ’em) or check your local nursery or farmer’s market for organic seed potatoes. I get seed potatoes from our local organic garden store each year. Yukon Golds are my #1 absolute favorites, but I usually grow several different kinds each year, including Kennebec, Red Pontiac, German Butterball, All Blue, and/or some various purple ones (whose names I can’t remember). 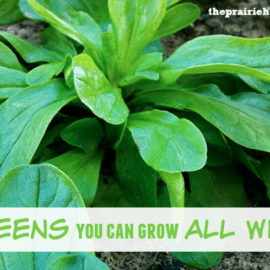 The varieties you pick will depend on your availability and climate– I do recommend picking options that aren’t easily available in your grocery store, though. I’ve found them to generally be more delicious, and it’s more satisfying to grow something you couldn’t get otherwise. 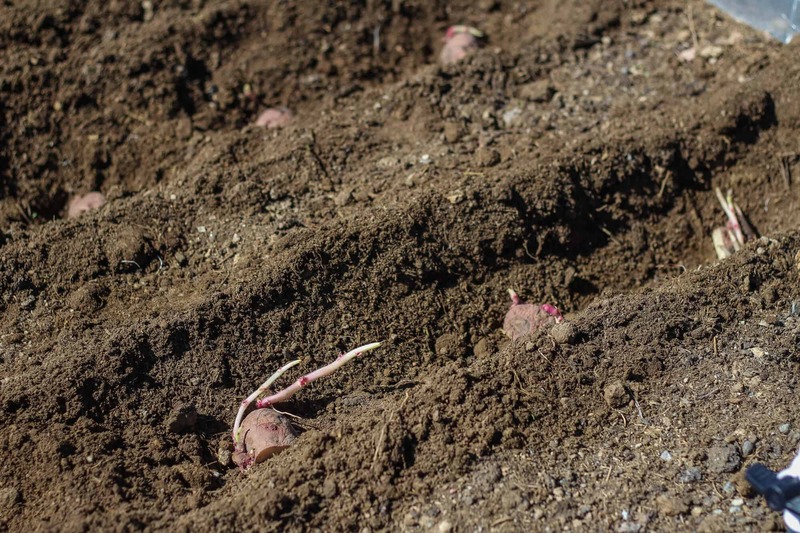 You can plant your potatoes a few weeks before your last frost date in the spring. Potatoes love to start growing in cool weather. Just make sure the soil has both thawed and dried out a bit. Since potatoes are a root crop, plant in loose, compost-rich soil with good drainage. Plant your potatoes in full sun. Plant them where you have not recently grown either tomatoes or potatoes (crop rotation is a MUST!). When planting, space them at least 1 foot apart, and have your rows about 3 feet apart. 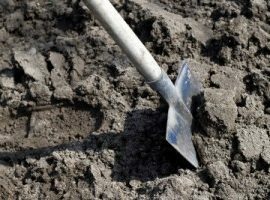 The classic way is the ‘trench and hill method‘: Start by making rows of shallow trenches, with the mounds of soil from those trenches in between the rows. Place the potatoes (cut side down and/or sprout side up) in these trenches and cover with loose soil. As your potato plants grow, hill up the excess soil around the plants, so that you not only get MORE potatoes, but you are also protecting your potatoes from the sun (sunlight makes them green). Keep mounding soil up around your potato plants until there is at least 1 foot of soil hilled up around each plant. I’m planting mine in my new raised beds this year— I’ll keep ya posted how it goes. 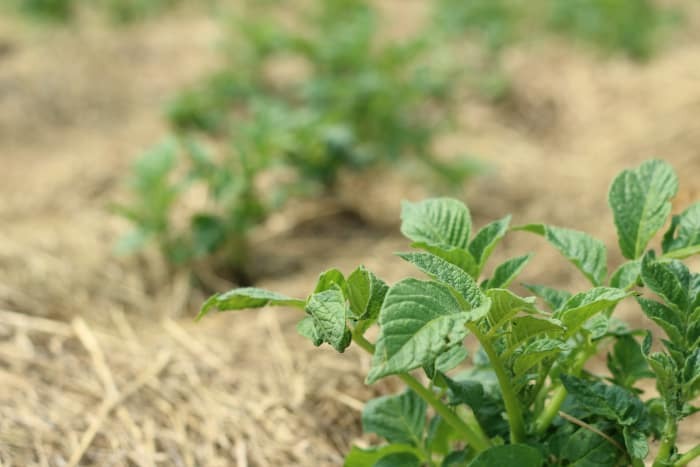 If you get tired of trying to find enough soil to hill up on your potato plants, you can switch to mulch instead, after you have about 6″ of soil. Mulch also helps keep the soil weed-free and cool. Potato towers: I’ve seen pallet towers, fancy wooden towers, and even recycled tires for potato towers. You basically add sides to the tower and more soil as the plants grow. If you have poor soil or limited space, this might be a good option for you. Potatoes in grow bags: You can grow potatoes in burlap bags or grow bags (like this one on Amazon– affiliate link). You start with the bags rolled down, and then bring the sides up and add dirt as the potatoes grow. 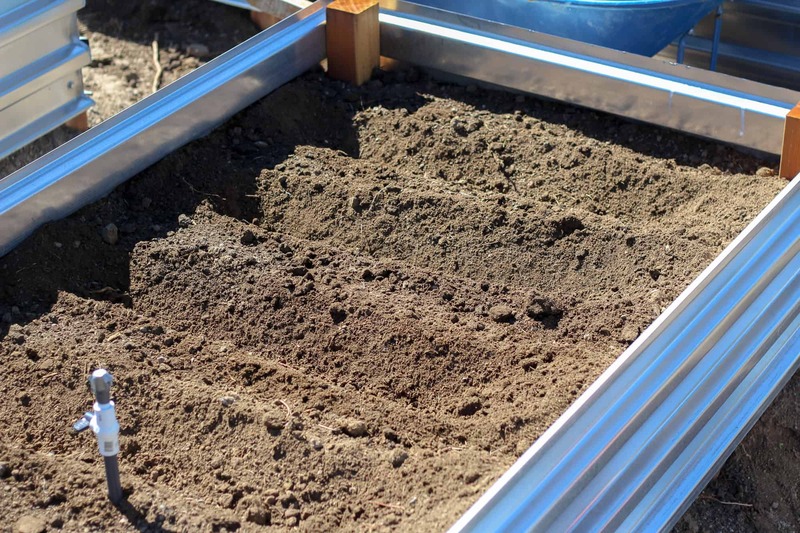 This method might work if you need mobile potato growing stations, or smaller batches of potatoes. Potatoes in mulch: I’ve experimented with growing potatoes in mulch, and while it worked, I suspect it did decrease my yields a bit. 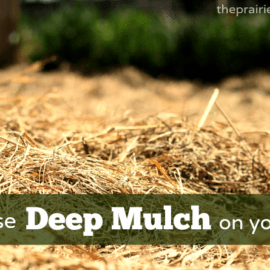 I like using mulch as you don’t have to dig the trenches as deeply, and you don’t have to mound with tons of soil– just add more layers of straw or hay as the plants grow. Potatoes in containers: Creativity is your friend when it comes to potato-growing containers. Trash cans, storage tubs, 5 gallon buckets, old bathtubs in the backyard… Just as long as you keep adding soil as the plants grow, almost any container could grow potatoes. If you’ve had success growing in containers, I’d love to hear more about it in the comments! Occasionally check to make sure the potatoes are properly covered with dirt or mulch and not exposed to sun, which will turn them green. Keep an eye out for bugs. Aphids can occasionally be a problem, however, the main culprit is the Colorado potato beetle. You are almost guaranteed to get potato beetles, so try to get rid of them as soon as you see them. (They’ll also lay egg clusters under the leaves, so lift the leaves to check that too.) In the past I’ve paid my kids to pick potato bugs/eggs or my DIY organic pest control spray is a good option too. On occasion, potato crops can be lost to late blight as well. I’ve not personally had to deal with this (yet! ), but if you see black or moldy leaves, it’s possible you have potato blight. Remove and burn the damaged foliage and be sure to always use high-quality seed potatoes to attempt to avoid it in the first place. Once your potato plants bloom, you can start harvesting baby potatoes for immediate use. (These are the most tasty, in my opinion.) Some people use digging forks, but you can also just dig into the soil with your hands (that’s what I usually do…). Use caution as you dig to avoid damaging the roots of the plants, and be sure to leave some potatoes to mature for later. If you are growing potatoes for storage, leave them in the ground for a few weeks after the leaves and stems turn brown and dry. This gives them a chance to thicken their skins for better storage. You can leave them in the ground as long as you want, really, just as long as you dig them up before your first hard frost. (You don’t even wanna know how many years I’ve been out frantically digging potatoes as a snow storm rolls in…) Do NOT wash your potatoes if you are going to store them. Just brush them off and call it good. 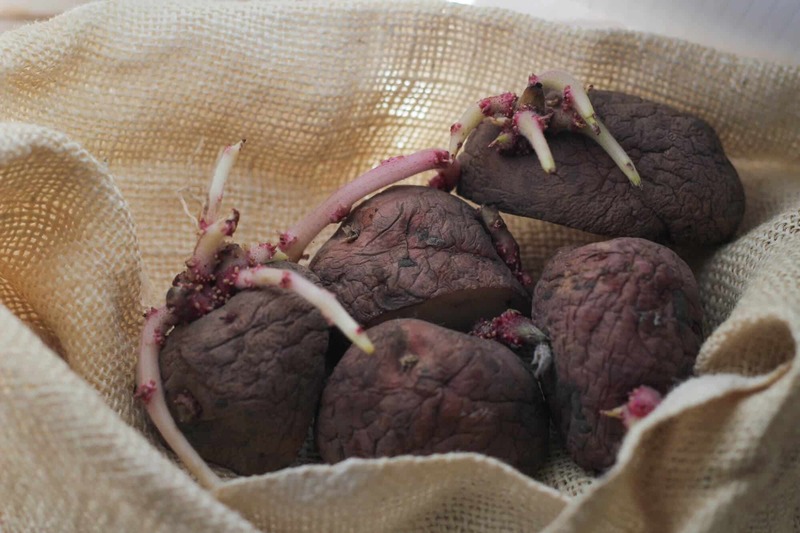 For storage potatoes, harvest them on a dry day and allow them to cure them for a few days before storing in a dark, cool, and well-ventilated place. They can last for up to 6 months in proper conditions. My great grandad always lined the trench for potatoes with wet newspaper to help with water retention. I do the same thing now and plant on top of where I was trench composting. I’ve found potatoes are heavy feeders and I get a good crop doing this! Mulching the hills helps forgetful gardeners from getting green spuds! I’ve been growing potatoes for years and years. 1. They are nothing like the grocery store dry spuds -homegrown taters are juicy, tender, delicious & will cook in half the time. Great post. Love your new beds! We love growing our own potatoes! I’ve had great success in towers made from welded wire fencing. 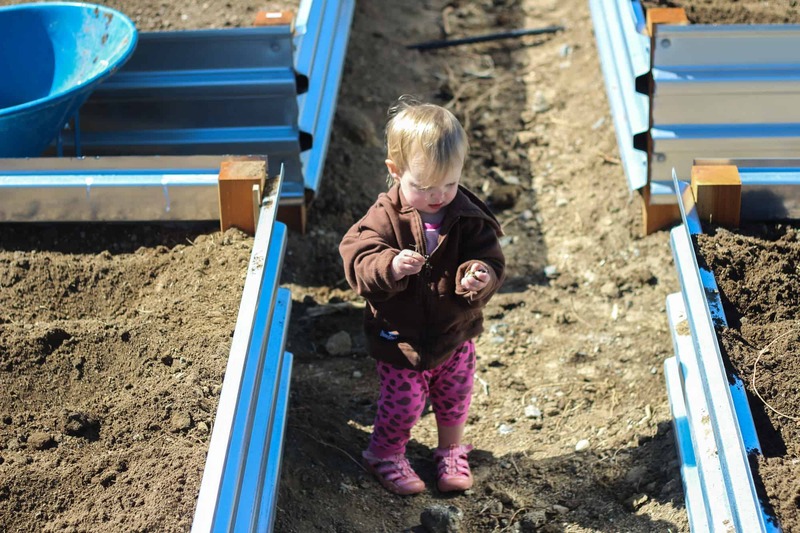 We layer with a combo of dirt and straw as our ground space is limited. I adore your garden boxes and would love more space in my garden! Love the idea of wire fencing towers! And glad to hear the method is successful for you, too! This year I have planted two different ways. I put some in large planters with fencing that I fill with oak leaves as they grow and two in mesh cat food bags. One didn’t make it, but I think that was due to pests. The other is the healthiest of them all. It just finished blooming and I think we will go harvest today. I have read that you are not supposed to use Oak leaves in compost or your gardens. Don’t remember why. Last year I was told that potatoes could be started indoors in pots and then transplanted to the garden when it was warm enough. I have done that twice now, and it works. It gives a little bit of a head start if you have a short growing season. I’m in Alaska, and I have never had my potatoes “leaves and stems turn brown and dry”. They usually are green until the frost kills them! When we were kids, we would go down to the creek and catch a whole bunch of small chubs & shiners. We would put a fish next to each potato then, cover the fish/potato with soil. We used to have some really good yields with this method and the flavor was awesome! Red Pontiacs were our preferred spud. They make great German potato salad! As I understand things, with potatoes you’re supposed to stop watering them after they emerge from underground and grown some. Then 2 months from harvest, give them one good soaking and stop watering for good. Has anyone else heard of this? I do it every year with my potatoes. Thanks for another great article. I absolutely love growing potatoes! There is nothing like the taste of freshly dug potatoes from your own garden. Been reading this blog on and off for several months now, am signed up for the newsletter (the only one I actually read from time to time). I wish I had found this sooner, and am resolved now to read as much as possible because there is so much useful, practical information-and it is so well organized and detailed. I have been disappointed in my garden because around late July each year I get overwhelmed. With the weeding-typically we get a real wet week in July and the weeds take over. Then I get discouraged, overwhelmed and depressed! I still get lots of great stuff but I know my downfall is lack of preparation. We’re gonna do it smarter this year and prepare it in the fall for the spring like we ought to have been doing-but your blog is basically going to be my go-to techical manual for pretty much the entire process, so, thanks so much for all the great info. Blessed be. Look into the Ruth Stout or Back to Eden or lasagna or no till methods of gardening. Basically use a thick layer or covering materials of choice or what’s handy. Join some Facebook groups that are based on these methods. You’ll learn so much. Yeah for Back to Eden, and no-till. Also, Herrick Kimball of The Deliberate American blog is experimenting by using his mini-beds-on-plastic method. I want to try that this 2019 vegetable garden. I haven’t grown potatoes yet but love to try don’t have space going talk to city Mayer see if I can put raised ones in the ally hope they let me use it. 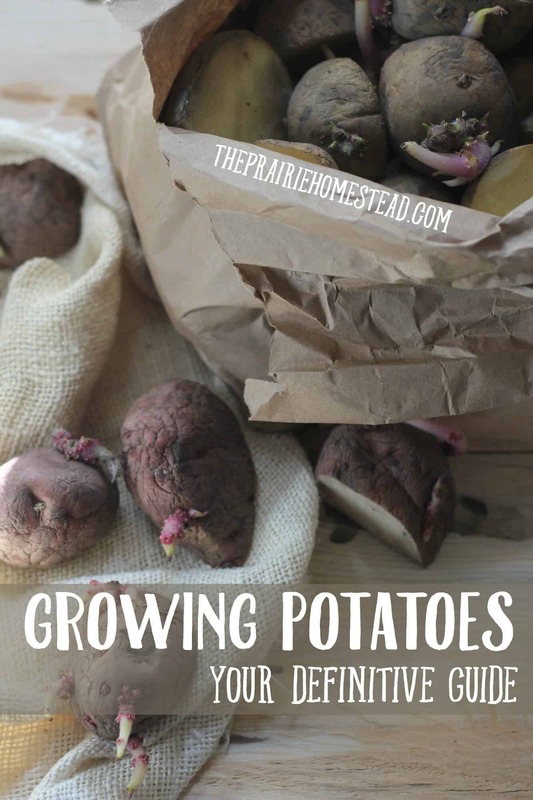 Can anyone tell me where to get great seeds to get the potatoes around here we don’t have anyplace to find stuff like that and also does anyone know if you can grow potatoes in winter in Oklahoma in southwestern Okla. Winters not that bad “sometimes” I just found this blog and I love it help me understand alot. Some of the potatoes from our garden last year have sprouted and gotten leaves. Do you think they will grow potatoes if I plant them as my seed potatoes? I reuse my potatoes each year and have not had any issues. I also sometimes use ones I have received from my CSA box. Then I know for sure they are good for the area. It has been years since I have purchased seed potatoes. Ive always heard of people using tires. Ive never tried it myself. Ive just started gardening last year. Would tires be ok to use? Or would the chemicals in the tires leak into the plants? The new snow tires for my truck were big and beautiful. The dealer said the old tires required a $2 charge each to dispose of them. When I got home, I put one tire down and filled it with good garden soil. I added a bunch of subarized potatoes. When they sprouted, I put the next tire on top and filled it with soil. When the sprouts grew up again, down went the third tire and more soil. Finally the fourth tire was employed. The potatoes grew and soon it was time to harvest. I leaned against the tower of taters until it tipped over … and the harvest began. Did you water them often? I have a horrible problem of over watering plants. This will be my first year growing potatoes. We have rock hard clay soil and a small backyard, so I’m using the potato tower method. You mentioned crop rotation, so I’m curious what to do next year, since the tower is the only real space I have for potatoes and I would like to grow again next year. Can soil amendments be used, or is there another reason for not planting the same crop in the same space? Two years ago I tried growing seed potatoes in a container. I did the layering method, when I sae green, I put on more soil. But, I think I didn’t add enough amendments to our clay soil and got very little yeild. I am going to try again as I love homegrown potatoes! 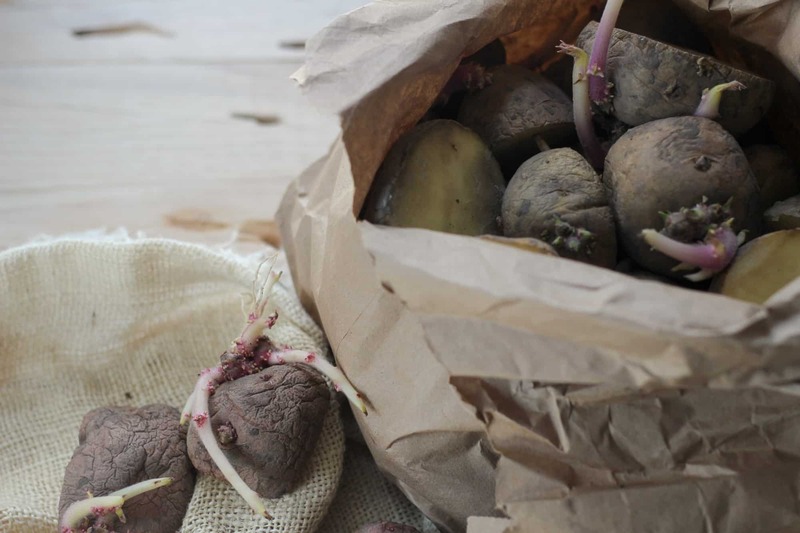 purchase at Wood Prairie Family Farm, 207-429-9765 100% organic potato seed in Bridgewater, Maine, http://www.woodprairie.organic I’ve heard that it is best to plant potato sprouts 12 inches long. 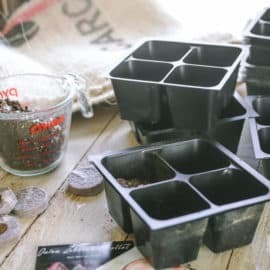 Also I’ve heard that you can grow sprouts after you remove them at a few inches long, right into a pan of potting soil or soil in your greenhouse or home where you minister some warmth and a growing light and of course, water, to them, and after frost danger, plant in your vegetable. Happy Gardening!!!!!! in 2019. Last year we built 3 potato boxes from old pallets. We left vents on all sides by not stacking the side slats one on top of the next; it was great for drainage. Our soil in Michigan is sandy, so we layered the boxes with ground soil, purchased garden soil, straw, and peat moss. We had a bumper crop! I was concerned to read in your article about changing location yearly for growing potatoes. We had planned to use the boxes again this year (and in the future). Will let you know the outcome. We also garden in raised beds. (Not contained, but raised none the less.) This is the method we use when planting potatoes because it causes no damage to the integrity of the beds and actually improves them: dig a deep trench in the middle of the bed and plant your spuds. Then as they grow, cover with compost. (Kind of like the technique for planting asparagus roots.) Not so much hilling but rather filling up the trench. After harvesting the spuds (which I do enjoy – takes me back to my childhood) we plant our garlic in that bed in October because it is fluffy and nutrient dense! Win, win!